There are many possible meanings behind a tattoo of an eye. For some people an eye tattoo is a representation of spirituality but for others it can a symbol that a deceased loved one watches over them still. 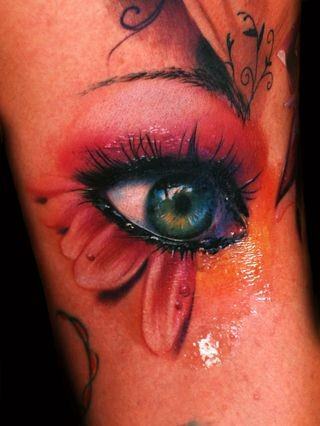 Tattoos of eyes can also be a symbol of truth, clarity, protection or even clairvoyance. 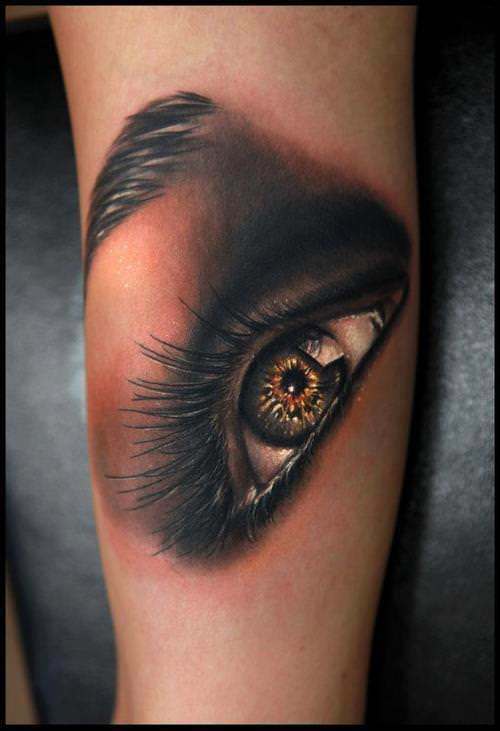 Why a Tattoo of a Human Eye? The eye is the organ with which humans see the world around them, giving human beings the sense of sight. This physical sense allows people to interpret color, shapes and depth, putting the world into perspective. 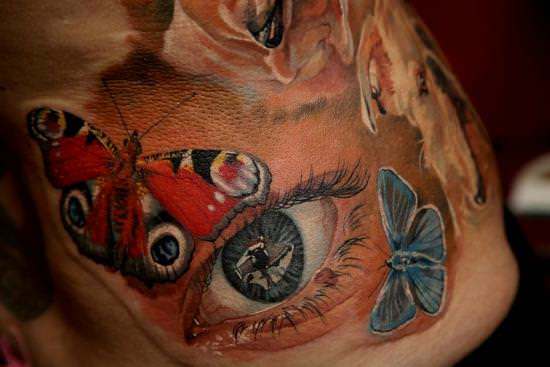 Tattoos of eyes sometimes have a meaning related to the sense of sight; for the person wearing the tattoo it may mean that they feel they have a unique perspective of the world. The sense of sight is a precious thing because after all, only you can see the world through your own eyes. The eye has been said to be the window to the soul. A person’s eyes can reveal how they are feeling at any given moment, even if they are trying to hide their true feelings. In many ways, a person’s eyes can be as expressive of a person’s attitude, personality and emotions as words and body language. The direction in which the eye looks can often be indicative of a person’s state of being. Making eye contact vs looking away expresses two completely different emotions. In Western culture, meeting another person’s eyes is a sign of confidence and respect. In many films the good guy and the bad guy end up in a battle of wills, trying to stare each other down. 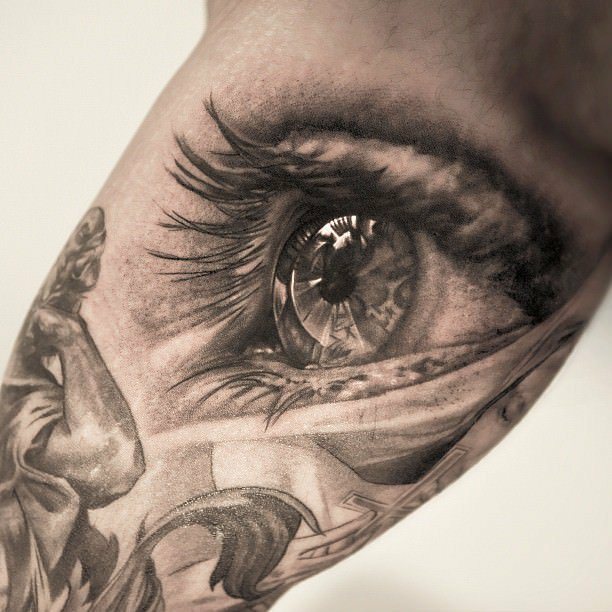 A tattoo of an eye can have a similar meaning as a symbol of confidence and self-assurance. Because eye tattoos are so appealing, they are often commented on and can be an unintentional conversation starter. 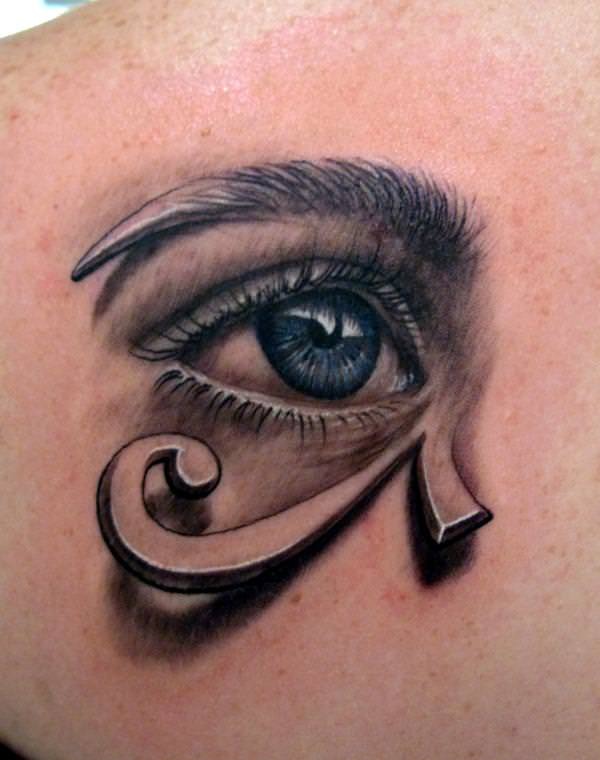 This means that tattoos of eyes are often chosen only by people who are open to being approached by others and are prepared for confrontations. The basic form of the human eye is one of the most recognizable and appealing shapes. As babies, human beings learn to make eye contact and from there, we learn to seek out a person’s eyes when talking to them to better understand the meaning of their words. The eye can be a tattoo symbol of humanity or the human soul, as it is one of the most quickly recognized human body parts. Eyes are fairly simple to represent in stylized art forms such as abstract art, cartoon art and graphic design. 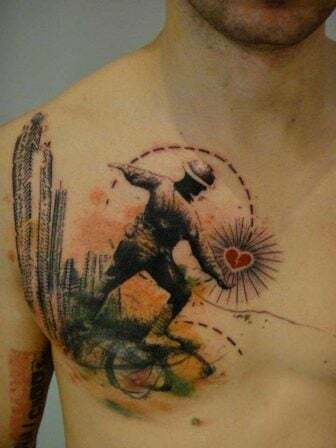 Even in tattoo art, eyes are often portrayed in a simplistic manner; a pointed oval with a circle at the center is all it takes to create a symbol of an eye. 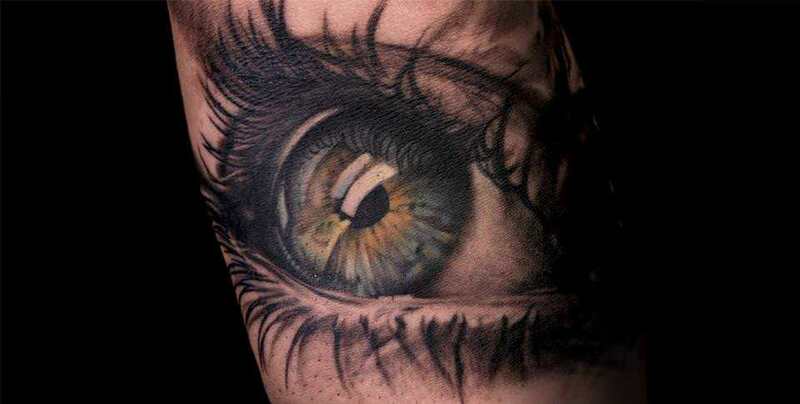 For people who want more humanity in their eye tattoo design a photo-realistic or hyper-realistic tattoo design of an eye gives all the detail, depth and soulfulness of the human eye; visual personality that stylized designs simply can’t portray. In order to create a successfully convincing tattoo of an eye, the tattoo artist must recreate perfectly the shine, texture and shades found within the eye. 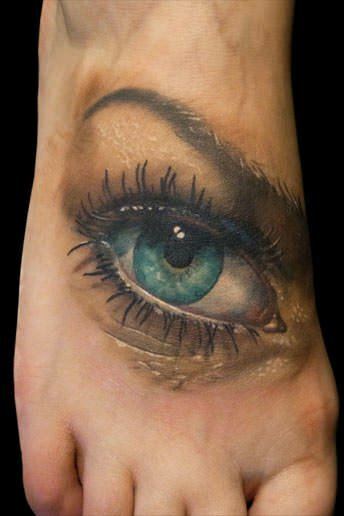 This is easier to do in monotone than it is to do with color, so a photo-realistic tattoo of an eye that is rendered in color is even more impressive than a black-and-white design. This is because the colors that we see at a glance are only the basic colors found within an image. There are always levels of color that only become apparent upon closer inspection; colors found in reflections, highlights and beneath a semi-transparent surface such as skin. 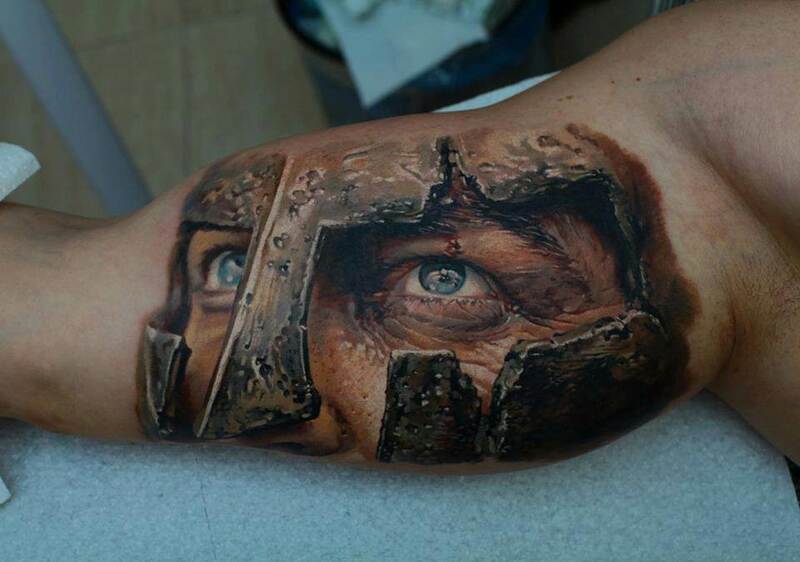 Tattoos of eyes have appeared in several ancient cultures from around the world. Often, these tattoos were a symbol of a protective god or goddess who watched over the wearer of a tattoo. 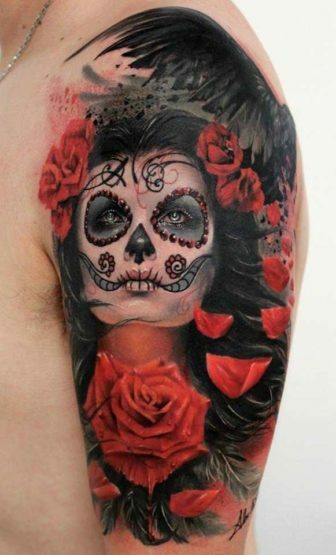 In modern tattoo culture, sometimes it is the eye of a loved one who has passed away that becomes the subject for the tattoo. This gives the owner of the tattoo the sense that their deceased loved one is still with them and watching over them, unseen but still insightful.